Paulo. He left the presidency of Força Sindical to be Federal Deputy for São Paulo, during two mandates.Creation of Força SindicalFrom 1987, when won the elections for the Presidency of the Trade Union of the Metallurgists Trade Union of São Paulo (1), our group modernized the entity. We created five sub-head-offices, equipped with cars and organized workers in factories as Union delegates, among other stuff. With this, the Union became known, as a reference, which approximated us of workers. The Metallurgists, for example, were the first to reduce the 48 hours workload to 44 hours remunerated. (2) They also were the ones who grew more in the guarantee of protection to the ill and the woman worker. However, in national level, the big majority of Unions did not participated a lot. Besides, CUT was in formation. It was a combative center, but of much control. The big debates of CUT did not resulted in wage agreements. They pushed the rope until it tear apart, causing many demission. There were two big Metallurgists Unions: in São Paulo and São Bernardo do Campo. We had 500 thousand people in the Metallurgists. The dream of CUT was to have this Union, the Metallurgists Trade Union of São Paulo, because it was the biggest. If they won the Union of Sao Paulo, they would be a unique Center. And this stuff of being unique is already an opposition to the idea of plurality, and democratic plurality. It was not up to us (the Union) to surrender to the radicals, which wanted to make the Union building other objectives. On the other hand, we also did not want to be identified with that unionism apathetic, bosses alike and behind, which was limited to manage the wage decreases. Then, we concluded that this thing of unique was not for us. It had to be democratic. In a factory, there are socialists, other, communists. There are right wind people, left wind, Catholics, Protestants, and the cupola also has to think about this. In the Union we have to have the several visions of workers. Why the cupola does have to be unique? We opposed to the idea of a unique Center and we created our own organization. We create this organization with the objective of fighting, but also look forward negotiation, because we thought, in first place, it was necessary to negotiate to exhaustion. We assumed, even with the divergences in one moment, it has to exist convergence between boss and employee. 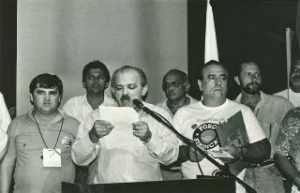 I remember two leaders very important, and with them, in the end of 1990, I decided to create Força Sindical: (Melquíades) Araújo, who was, and still is, President of the Food Federation, and Lucânia, (3) of the Shopkeepers Federation. We were representatives of three big categories: metallurgists, shopkeepers and food. We worked as a nucleon, and each one leaded the proposal to his category. We wanted to form a Union Center not radical or even fix. This national Força Sindical should participate of the general fights, looking forward to represent workers in the great national matters, having as its “flower of the day” the combat with negotiation. We created, then, a very strong fortress. We participated of the elections through Brazil. In Volta Redonda, for example, it used to be a Union belonging to CUT. We went there and we won. We always had an affirmative program of fights, proposals and projects. And we had the guts, since the beginning, of going for it, and guarantee our independence. It was not characteristic of the Unionism of that time. During the government Fernando Henrique Cardoso, for example, we opened a big process for the reposition of the losses of more than 40% of the Guarantee Fund of government Collor. I opened this process myself, in the Metallurgists Trade Union. It is a good example of how Força Sindical never lost the notion of independence and today is one of the biggest Centers of the Country. Força Sindical kept its independence in relation to the governments. Despite acting in government Lula in the negotiation of the minimum wage, we act with independence. It is not possible to do Unionism if there is not independence of the entrepreneurs, parties and governments. But today there is much confluence. Revolutionary radicalism does not exists anymore. There is not anymore this stuff of “Let us finish with the system of production, of market”. We defend a market with strong regulation. But today there is not anymore a sector which wants to take the Union as lever to make revolution, as there were before. I think the Centers are accomplishing their role, but I also think that Unions can do more they are doing. The Unions have to be more combative, now that we are in a moment of economical growth. Moreover, in moments like this, it is necessary to use determined tactics to take even more advantages for worker. For example, when there were the Monark (Brazilian factory of bicycles) and Caloi (Brazilian factory of bicycles and equipments), we use to stop one and let the other working. There was no way of entrepreneurs dismiss workers. What I mean is that we have to use a lot this actuation by sectors, regions, factories, to take what we cannot with a general agreement. We had to shake the Union reality. I believe that the union among the Centers is possible and very positive. There is no reason to divide the Union movement in banners as the workload reduction. Everybody has to be together and negotiate. We will not go out of a workload of 44 hours to 40 hours from one moment to another. When we achieved the 44 hours, in the Constitution of 1988, the process was to reduce one hour by semester, until we pass from 48 hours to 44 hours weekly. Now it is possible to pass from 44 to 40, also gradually. The Centers had to come to this agreement. I think it is important the demonstration of force, the May, 1st , with two or three million people and all the Centers together wielding the banner of the workload reduction. The 20 years of Força Sindical have been covered through a correct path, with competence and responsibility. The main banner must be the workload reduction. But I think Brazilian unions have to work out the problem of sponsoring. It is not possible to finish the tax suddenly, but it is not good for Brazil to have this kind of tribute. And it is a plague! The way out is to negotiate! Força Sindical was created to lever the Unions. And this tax is from the times of Getúlio. It comes a time when the Unions have to walk with its own legs. All the institutions which have long life are the ones that renew, and I think this institution made this. But we have to look for an alternative for the matter of sponsoring. 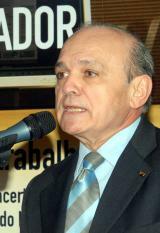 (1) Medeiros was elected for the Presidency of the Metallurgists Trade Union of São Paulo in 1987 and 1990. (2) In 1985 metallurgists made a strike of 54 days, for the 40 hours week. The Metallurgists Trade Union of São Bernardo do Campo and Diadema begun the movement, and it also counted with the participation of the Metallurgists Trade Union of São Paulo, with the estimated adhesion of 290 thousand workers. The strike, of 54 days, had as result the workload reduction from 48 hours to 40 hours weekly, in some factories, and 44 or 45 hours in others. This fight had strong influence for the elaboration of a labor issue in the Constitution of 1988, which consecrated in its text the legal workload of 44 hours. 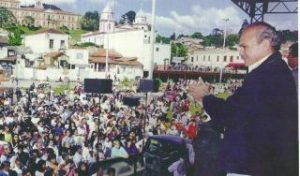 (3) Paulo Fernandes Lucânia (1940-2007) was President of the Federation of the Employees in Commerce of the State of São Paulo (FECESP) from 1989 to 2007.